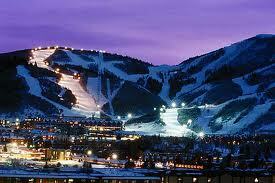 Park City, UT here I come!!! This small, quaint town has everything; great friends, the best snow on the planet, the finest ski resorts (The Canyons are my favorite!) the most delicious eats and the craziest night life. I can already feel the cold in my bones and smell the fresh winter air. It has been my home on and off since 1999 and I’m going in 4 days!!! I’ll share photos and menus of the fantastic establishments that I dine at and attempt to make the healthiest choices possible 🙂 Until then, PEACE! A few weeks ago, I put my precious juicer away, locked it in a cupboard. Sad, I know. The sugar in the raw juice was too high glycemic and was messing up my insulin levels on an already screwed up thyroid. Instead, I have been making SUPERFOOD SMOOTHIES!!! YUM!! Put it all in the blender, NutriBullet, food processor, or anything else that mixes and blend away!! It looks gross but soooo delicious! Enjoy! Avocados contain healthy monounsaturated fats and potassium, which reduce cholesterol and help control blood pressure, respectively. When eaten with other vegetables, avocados help the absorption of fat-soluble carotenoids, according to the March 2005 “Journal of Nutrition.” These carotenoids play an important role in cancer prevention. Leafy, green vegetables such as spinach, mustard greens, Swiss chard and kale are all considered super foods. The Center for Science in the Public Interest reports that these leafy greens offer rich amounts of vitamins A, C and K, folate, potassium, magnesium, calcium, iron, lutein and fiber. Spinach contains phytonutrient flavonoids that provide antioxidant protection from certain types of cancer, especially prostate and ovarian cancers. It also contains lutein for eye health. Spinach can guard against macular degeneration and cataracts. One cup contains more than 1,000 percent of your recommended daily allowance of vitamin K, according to the World’s Healthiest Foods. Eat 3 meals a day! While studying to be a certified holistic health coach at the Institute for Integrative Nutrition, I am trained in over 100 different dietary theories including vegan, Paleo, South Beach, Bio-Individuality, Best Life Diet, Gluten-Free Diet and many more. Although people are different and no one diet works for everyone, I can help you find a way of eating that will bring you to optimal health and a balanced life. I’ve tried vegan/vegetarian, Paleo, Atkins, SlimFast, and a few others for weight loss only to gain the weight back. Currently, I am following the Ayruveda lifestyle because it’s simple and do-able. Sit Down and eat. Enjoy eating. Don’t eat on the run, or watch TV or work on the computer while eating. Don’t just eat raw foods. Eat freshly cooked food. Eat with proper frame of mind. Be happy when you eat, not depressed, worried, angry or sad. You may ingest those emotions with food, and it will not be digested well. Eat enough quantity that you feel full. Don’t eat less, you may end up eating in couple of hours, or don’t eat too much. It will create indigestion and you will feel lethargic. Take time, chew food longer. You will enjoy it more. My Doctor recommends eating small frequent meals – ( 5-6 times a day). Why does Ayurveda recommend eating only three meals? Eating three meals a day and zipping the lips in between is the perfect way of eating. It takes about 5-6 hours to go thru’ all stages of digestion. If we eat before, food stays undigested, causes gas, bloating and, discomfort. Instead of eating smaller meals, we should eat enough to feel full, so we don’t feel hungry soon. Why Does ‘Snacking’ and ‘Grazing’ Discourage Fat Metabolism? In the old days folks had supper at 5 or 6 pm and then ate nothing until breakfast, around 7am. It was common to go 13 hours without food and break that fast (and thus reset fat metabolism) everyday with “break-fast.” This tradition has been in place for thousands of years around the world, until now, when we are the heaviest we have ever been. Eating 5-6 Meals a Day is Just Not Sustainable. I conducted a preliminary study based on my book The 3-Season Diet in 2000. We had the group eat 3 meals a day with no snacks and measured weight loss and a host of psychological factors. The more you strain and starve yourself, the more the body perceives the weight loss program as a fat storing emergency. * To get the body to burn fat naturally you have to convince it the war is over. * We do that by encouraging the body to burn fat naturally and effortlessly. Step 1: Eat 3 good, healthy and relaxed meals each day – with no snacks. NOTE: If you have trouble eating 3 or 4 meals a day — please read about an amazing blood sugar stabilizing herb below. Graduate to Step 2 only when Step 1 is effortless. Graduate to Step 3 only when Step 2 is effortless. Graduate to Step 4 only when Step 3 is effortless. Drink copious amounts of warm water between meals. Enjoy one cup of herbal tea with raw honey before bed, if needed. Continue Step 4 for 4 -6 more weeks. Having Difficulty with Cravings or Eating Only 3-4 Meals a Day? If eating 3 meals a day presents a challenge, or you just can’t seem to muster the will power to give up the dark chocolate, coffee or jelly beans, or your cravings are just out of control, let me introduce to you an herb that is nothing short of amazing. Take 1000mg of Gymnema before meals for 2 weeks. Then, take 500mg of Gymnema before meals for 4 weeks. His teachings caught my attention and made sense to me. For 2 weeks now I have eaten only 3 meals a day and have lost 4 pounds nor am I starving or deprived of food. Try it. If you have any questions, please feel free to email me! Peace! It’s almost 2013!!! New Year’s Resolution time! Lots of people try to give up an addiction like smoking, chocolate, french fries or soda. For some it’s a new beginning, a career change, moving to a new city, perhaps a new love. For many it’s to lose weight and be healthier. For health clubs and gyms across the US, January 1st is their Black Friday. Now is the time to join a club! Many gyms have reduced or no cost membership fees and some even offer free training with a personal trainer when joining. Get moving! Get healthy! My New Year’s Resolution is simply to ‘Smile, breath and go slowly’ ~Thich Nhat Hahn. We live in a society that moves 90 miles an hour, eats in their cars while driving and cursing at other drivers in rush hour traffic, addicted to caffeine, stressed out, medicated to the max etc…..STOP!!! Breathe. Everyone wants a magic pill to lose weight, to wave a magic wand and the fat will disapear, to drink a magic potion that melts away fat….STOP!! That doesn’t work. Breathe. Chamomile tea with Lemon, Honey and Cayenne Pepper. Lemon juice contains high amounts of vitamin C, an antioxidant that helps the immune system. Lemon also acts as a purifier and supplies potassium and may also boost fat burning. Cayenne pepper has many healing properties and ingredients, such as capsicum, which helps with stomach problems, circulation, and heart problems and provides B and C vitamins. The directions are simple (because I like simple) brew a cup of hot chamomile tea and let steep for 3-5 minutes. Add a tablespoon on honey, 1/4 of a fresh squeezed lemon and as much cayenne as you can handle, without sneezing haha! I like it cold too. I brew a gallon of tea, put it in a pitcher, toss in a few cubes of ice and save it in the refridgator so that way I can sip on it all day. Here’s to a New Year, a new you and great health! Peace! I love to cook and am pretty good at it if I do say so myself 🙂 When I cook, I try to keep it simple and healthy, and use fewer indgredients and to bring out the natural flavors of the food. Whatever is in my fridge or pantry is what goes into the pan and today it happened to be tilapia and local grown Florida tomatoes, yum! Then add the chicken broth and tomatoes and simmer for a few minutes. 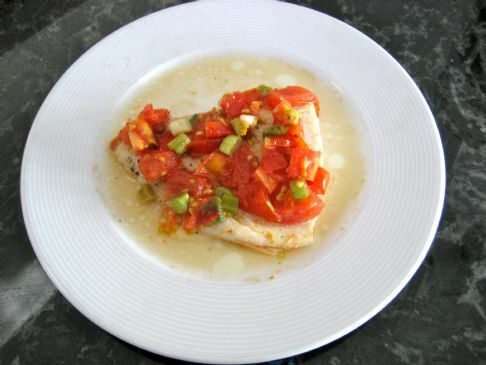 Sprinkle salt and pepper on the tilapia fillets and toss them into the mixture. Simmer until the fish is flakey. Eat and enjoy! 1) WATER! Drink 1-2 glasses of lemon water before meals. A hydrated stomach will produce the necessary acids to digest food properly. 2) GREEN TEA helps to burn fat, aid digestion, balance blood sugar and has many antioxidant benefits. 3) OIL & VINEGAR on salads will start the digestion process and balance blood sugar. 4) SPICES! Jump starts the digestion acids, slows the absorption of sugar and increases the amount of calories burned during each meal. Try peppers, ginger, turmeric and cayenne. 5) BEETS & GREENS (my favorite!) helps to move the bile and boost the digestion process. 7) NO COLD DRINKS! They reduce the digestion fire. 8) DO NOT EAT LATE AT NIGHT! 10) RELAX! Sit down to enjoy your food. Avoid standing or driving while eating. ‘If you eat standing up, death looks over your shoulder’. Let me begin by saying that I am one of millions of women that struggles to maintain a healthy body weight. Yup, me. A health coach! And I feel the word agonize is better than struggle. My whole life, almost 36 years have been an agonizing struggle of huge weight losses and gains. Estatic when the weight is shed and miserable when I realize it’s back again. This time has been the worst, but the way I see it, life changing! Until two months ago, my lifestyle was a vegan/vegetarian diet that I enjoyed. I loved to read vegan books and cook with fresh veggies and make warming soups on cold days and then one day I caught myself red handed eating tons of GMO laced soy products out of convience. What a mess! I screwed up my metbolism, threw off my hormones and gained an unbelievable 24 pounds in almost four months!!! 24 pounds! Ouch! I eat well and exercise 5-6 days a week…. I began my research. 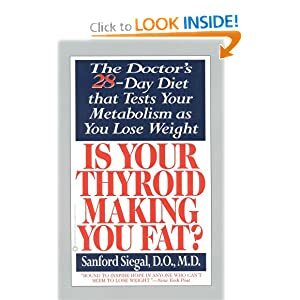 ‘Is Your Thyroid Making You Fat?’ by Dr. Sanford Siegal proved to be an easy and informative read. Many of his chapter summaries were descibing me! For example: 1) Many overweight people do not overeat, 2) Hypothyroidism may be triggered by a variety of factors such as age, pregnancy, or medications, 3) An indicator of low thyroid function is lower-than-normal body temperature and 4) Blood cholesterol level is usually elevated in those with hypothyroidism. A week of testing my basal temperature proved a very low normal; 96.3 and my cholesterol is through the roof! Enough of being fat and buying larger, uglier jeans….I went to the doctor to get my blood checked and to obtain a ‘natural’ thyroid medicine. The very pleasant doctor took one look at me and said ‘You need to lose weight’. Duh. I told her of my plight. She listened with kind eyes and told me neck was swollen and that I could benefit from a medication. After reading Dr. Siegal’s book I opted for Amour thyroid, a natural medication, not the typical sythetic drug. The doctor happily wrote out the prescription and sent me on my way with instructions to return in 3 months for more lab work and possible medication adjustment. So check out the book and follow me on my last weight loss journey, for good. But don’t worry, I won’t bore you everyday with weigh-ins and mundane details, I have plenty of stories, articles, recipes and this and that to keep you coming back for more!